Artisan food producers Tastefully Yours in Waterford had been in operation since 2009 and had noticed that their range of Little Thai Kitchen curry sauces had become so popular, they deserved to be branded in their own right. They engaged a design company to create new labelling – and came to us to ask us to create a website for Little Thai Kitchen. We were delighted to do this for them. 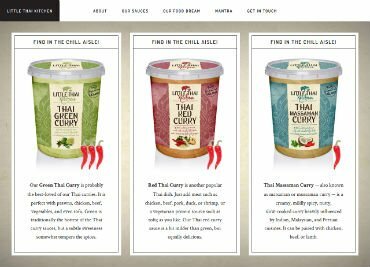 We established during discussions with the client that for launch, they simply required a brochure site, to showcase their three Thai sauces. Further sections for recipes, new products, etc., could be added later. Together, we reviewed other similar sites for other food products, and agreed a website structure and budget for the project. This became an express website build, as the client was anxious to have it ‘live’ before launching the sauces into a number of shops. Accordingly, and with their help, we efficiently crafted text content to make the mouth water. We then built the site in such a way that images of the sauces are the centre point of attention, but with all other elements of branding prominently displayed too, to give a real Thai ‘taste’ to the site. Our clients were delighted with the finished website, saying it was exactly what they’d been hoping for. Just click here to see the finished website.